Eruption at Castle Geyser, Yellowstone National Park, Wyoming, U.S. Creative Commons photo by Brocken Inaglory, Wikimedia. The Energies of Now are taking on more Fire, where we’ve had an ocean of Water in recent weeks, though the sensitive, watery, tidal essence of the Neptunian-Piscean is still very much in play. That said, it’s good to note that Fire and Water create steam, or hydro-thermal baths, or boiling water, or doused passion, etc. … actually, and metaphorically speaking. So lest we Go All Mars (Fire) and bubble over, or get too steamy (in less than helpful ways), or feel like there’s still a wet blanket on our energy and passion, here’s an Energies of Now update. Geyser in Iceland. Public domain image courtesy of pd4pic. Fire and Water will continue to be foremost elements in the Energies of Now, so this is a timely reminder … and an Orienteering clue-guide as well. What’s bubbling for (and in) you? Read on, and see what stirs into your awareness. Wishing you happy and wise navigating as we ready for a new season … and a new (astro and seasonal) year’s Vision Quest and Hero/ine’s Journey. For Current Specials on Astro Readings and Vision-Quest Pathfinding consults, check out the Specials-of-Now Page. 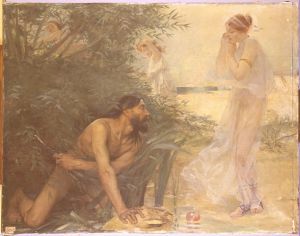 Jean Veber, Ulysse et Nausicaa, 1888, Paris, Ecole Nationale Supérieure des Beaux-Arts. Public domain image courtesy of WikiMedia. Sounds like life, doesn’t it — the long journey full of adventures, changing fortunes, new understandings, and gravitas-creating wisdom? Or so we would hope, in any case. We’re each on our very own Odyssey, and we’re on a collective Odyssey, too, in these wild and wily transformative times. Fresh Beginnings: Who’s Your Muse? New Solar Year. New Lunar Year. New Moon. New vision. New beginnings. New adventures. New mindset. Any time we begin anew -- or want (or need) to stir new inspiration and meaning into what's already underway -- it's a fine time to invoke our Muses. 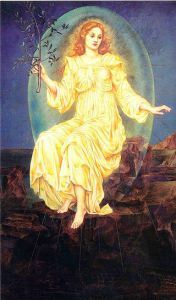 This Sophia's Children article explores the tradition of the Muses of Inspiration, and how we might connect with our own Muse ... or Muse Posse! You'll even find clues about how to spot the Muses in your astrology chart (which itself is a clue-map from a long-running wisdom tradition!). 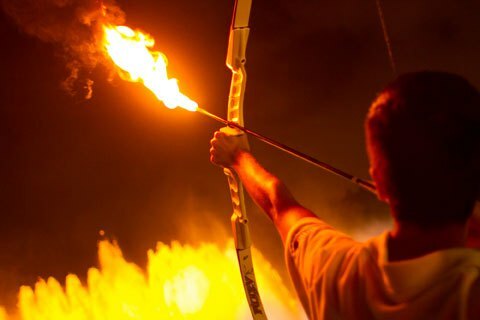 Archer at the opening ceremonies of the Barcelona Olympic Games — an exquisite and elegant moment! Ahhhh, yes, we enter anew into the Season of Vision-Tending and renewal. It’s always a fine time to renew, revitalize, regenerate, and re-vision, of course. But there are also times that are potent in their adding support to just that. This is just such a portal of time in the coming weeks and few months. Plus, we all know how it feels to be anxious, frazzled, and ‘behind’ as we move through the often-stressful (for many) holidays and into the new year. Tending these fires, strengthening our connection to what truly matters, and stirring vision and attending to renewal, eases the way considerably. That makes visioning and renewal very, very practical. What Vision-Seeds and “new greenings” will grow in your garden in the coming weeks and months? It’s the perfect time for checking in with the deepest stirrings of heart-and-soul … a Season of Vision-Stirring, Vision-Seed Planting, and Vision-Tending. I’ve got a Vision-Stirring feature-page on the Sophia’s Children work-table, but for right now, here’s some Vision-Season inspiration. Just what fiery arrows are we aiming, and at just what destinations … and in service to what (or whom)?